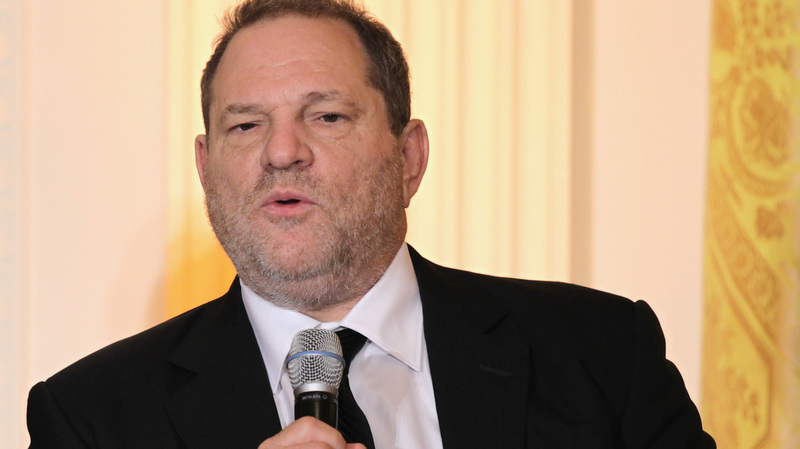 Harvey Weinstein Banned For Life From Producers Guild : The Two-Way Citing Weinstein's "decades of reprehensible conduct," the Producers Guild of America voted unanimously to remove him from its ranks, which it said was an "unprecedented step." Harvey Weinstein was banned from the Producers Guild of America in what the group called an "unprecedented" step. The Producers Guild of America has removed Harvey Weinstein from its ranks, hitting the movie mogul with a lifetime banishment that the group says came via unanimous decision, after allegations surfaced that Weinstein sexually harassed and assaulted numerous women. "This unprecedented step is a reflection of the seriousness with which the Guild regards the numerous reports of Mr. Weinstein's decades of reprehensible conduct," the Producers Guild said. "Sexual harassment can no longer be tolerated in our industry or within the ranks of Producers Guild membership." After decades as one of the most powerful figures in the entertainment industry, Weinstein has been disgraced by dozens of allegations of inappropriate and/or criminal behavior. Stories in The New York Times and The New Yorker detailed accusations that Weinstein forced physical intimacy on women and threatened to harm their careers. In its announcement, the guild said Weinstein resigned from the organization rather than contesting the banishment decision. It added that members "are given 15 days' notice before disciplinary action is taken." The move comes two weeks after Weinstein was expelled from the Academy Of Motion Pictures Arts And Sciences. Around the same time, the Producers Guild began the process of terminating Weinstein's membership. Fallout from the case has resulted in scrutiny of other Hollywood figures — including Amazon Studios' Roy Price, who resigned after women went public with allegations against him. It has also prompted a number of women and men to speak out more openly and forcibly against sexual harassment. Dozens of women have now made claims against director James Toback. And over the weekend, actor Anthony Rapp accused actor Kevin Spacey of sexual misconduct, leading Spacey to apologize.